The rosary had a strong effect on Bobby Gross, but not as he’d intended. He heard the call to the priesthood in his soul during Mass. It was an internal prodding. “You’re going to be a priest,” God told Gross, now a deacon serving at Our Lady of Guadalupe Parish in Buckingham and little more than a week shy of ordination to the priesthood on May 17 at the Cathedral Basilica of SS. Peter and Paul. “No I’m not,” Gross responded. He thought teaching was a good possible profession for him, so he held his ground for six months and started praying the rosary to get the interior voice, this calling, away from him. Praying, instead, left him more at ease with trying the seminary. 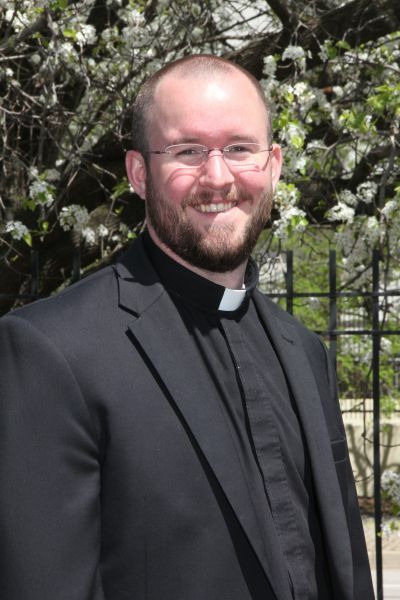 Already a youth minister at St. Agnes Parish in West Chester, Gross moved to the Philadelphia area to remain close to Sea Isle City, N.J., where he and his friends stayed during summers, and to search for a job after attending Loyola University Maryland, in Baltimore. “I always knew I liked to help other people,” Gross said. He gained more interest in the faith when he began meeting the kids and families, and started returning to Sunday Mass. Msgr. Edward Deliman, now pastor at Our Lady of Fatima Parish in Bensalem, hired Gross as youth minister at St. Agnes, where he was pastor from 2003 to 2009, and celebrated the Mass in which Gross heard his calling. He also let Gross live in St. Agnes Rectory during this period. The pastor said he saw a spirit of service and excitement in Gross, qualities that led to his hiring. Since the hire, Msgr. Deliman and Gross spoke often. As a sign of their closeness, the priest will help Gross don his priestly vestments during the ordination rite. It is a traditional honor that a deacon who is about to be ordained invites a close priest friend or relative to do. Msgr. Deliman, who will also preach at Gross’ first Mass the following day at St. Agnes, said he is confident the church will receive a good priest in less than two weeks. Robert Gross, Bobby’s father, wasn’t surprised when his son entered the seminary because he was an involved and caring person who served at the altar growing up. Active as a teenager, Bobby played lacrosse at St. Anthony High School in South Huntington on Long Island, N.Y., where his parents raised him. He’ll celebrate Mass there just after ordination. He later designed a preseason retreat for the Loyola lacrosse team, from which Johns Hopkins University and the United States Military Academy at West Point took the outline for their own retreats. Robert said the trips with the youth group opened Bobby’s eyes to the priesthood and attributed Msgr. Deliman as a major impact on Bobby’s vocation. Robert said Deliman shared his spirituality with his son and gave the former St. Agnes pastor the bulk of the credit for Bobby becoming a priest. Bobby entered St. Charles Borromeo Seminary in 2009 but questioned his vocation about two years into the program. Ultimately, he decided the priesthood was still for him. Ironically, Robert himself attended another seminary for two years before departing, the opposite of Bobby’s move. They often bantered about this together. “Dad, if you went to St. Charles, you’d love it so much you wouldn’t leave,” Bobby would joke to his father. “If I stayed, there’d be no Bobby,” Robert would respond.